In contemplation on the subject, I identified eight steps in my own practice that seem to flow as a cycle. I also discovered that between each of these phases or states of my practice lies a quality. Though the pattern of these steps seems to flow, over time from one step to the next, it seems the quality expands and contracts within the present moment while working on the progression from one step to the next. (For you yoga geeks, think spandha). I created a graph that shows the circular flow, and also the expansion and contraction of each quality between each step. I created this for me personally as accountability. I need to be sure that I’m embracing All aspects of this cycle. I have a bad habit of skipping the aspects of yoga that I’m averse to and gravitating towards that which I find enjoyable. Once I completed this, printed it and added it to my practice area, I realized it could also be beneficial for those struggling with the same challenges. To eliminate any confusion as to the labels and word choices, I have clarified and defined the meanings below. A fundamental set or series of postures is paramount to every yoga practice. A student will strive to incorporate the major categories of postures within each practice. These will include one or more asanas from the following: Standing, Seated, Forward Bends, Back Bends, Twists, Balances, Inversions. They will also incorporate asanas to target muscle groups or parts of the body as well. The idea is to have a well rounded set or sequence of postures that targets all parts of the body. One intention of practice is to move in a way where the body experiences ease. When the asanas are new, there is a degree of effort, but as the effort becomes familiar, the student can practice with grace and effortlessness. This also requires practicing with beneficial alignment and concentration of muscular engagement. As a student progresses, effort remains, but the struggle to remain in the posture or move between postures dissipates and positive feelings are cultivated. An asana practice can easily be full of exertion. While some students enjoy and benefit from a strenuous practice, it is important to move towards a state of equanimity in yoga. A student can aspire to move from equanimity into experiencing full integration of body, mind and movement and immersion into all sensarions and emotions. While the state often valued in this phase is bliss, there are also other states of mind that can be ‘enjoyed’ in this phase of practice development. This is the reason I chose enjoyment instead of ‘bliss’ for this stage. Being that it is human nature to desire progress and attain new levels of experience, one will naturally aspire to discover new and often challenging poses. For some, there’s a conflict in trying to be ok where one is with their practice, or perhaps aspire to eliminate desire. It’s all about balance. Be inspired, desire and aspire within reason as to not create suffering. When a certain level of physicality is desired, one must develop a logical series of steps to attain what is desired, and then begin to practice and become conditioned to that level of physique. The same principle can be applied to postures, sequences, or transitions between poses. Sometimes preparation does not just include the physical component. Sometimes it may incorporate other aspects of one’s life. Often during the learning phase, one is not proficient at execution of specific asana. Sometimes this is due to being unfamiliar or encountering obstacles such as weakness or undeveloped technique. Part of the learning process is the state of dealing with the unknown. Sometimes being in this phase leads to aversion or dislike. Embrace being bad at something and be ok with it until you become better. Dealing with dislike or aversion to something unfamiliar or difficult can easily move in either the direction of failure. 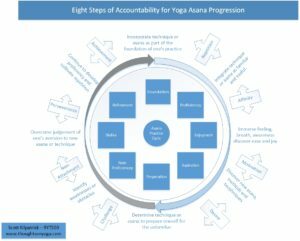 Sometimes it is beneficial to focus on what aspects of the asana or technique is disliked and dissect the preparation into more steps. The steps can be compartmentalized into manageable pieces to overcome dislike systematically. Once dislike is overcome, and the phase moves into the plane of achievable, it is important to refine the asana or technique. Sometimes the use of props, focus on alignment or other dynamics will allow the student to refine the asana to the point where it can easily be integrated in some form into the fundamental group of practice. At the end of the cycle, what once began as a inspiration is now part of your fundamental practice and still slowly moves from a place of newness towards a state of enjoyment. While this happens naturally, my expectation is that embracing each of these steps mindfully will bring about more control over one’s progression in their asana practice.